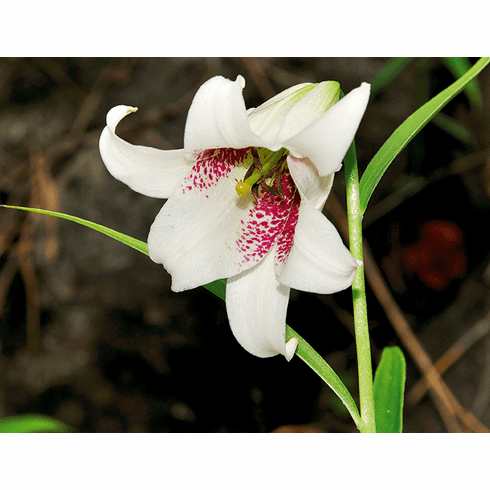 Derek Fox says in his book 'Growing Lilies' that "to the lily enthusiast, this is not so much a single species, but a complex group of lilies" as the succession of photos of color variants shows. Extremely rare and no longer known in commerce, this is the "type". It ranges from near white to a very soft pink. Discovered by Collett & Hemsley in 1890, it is found growing between 4,000 and 10,000 feet (1,200 to 3,000 meters) in elevation in open, dry, and stony landscapes. Seed germination is immediate epigeal. Title photo comes from the web site of 'BKF Forest Herbarium', The Office of the Tree Plant Forest and Plant conservation Research Bureau, Dept. of National Parks, Wildlife and Plant Conservation, Bangkok, Thailand, 12 October 2016 posting, and shows this species in its natural habitat in Thailand. 'Lilium bakerianum var. bakerianum' and Lilium primulinum var. ochraceum both call Thailand home. Our photo is from the collection of Bill and Mary Hoffman of L. bakerianum type as grown by Edgar Kline as preserved on a nearly 70 year old glass mounted slide. We expect the white base color is due to fading of the nearly 70 year old glass mounted slide and this nursery grown plant probably had a pink cast to it. Discovered by Collett & Hemsley in 1890 it grows between 4,000 and 10,000 feet.